Although I have reserved any vocal judgement on G.I. Milsim to this point, I have long been a tacet opponent of the .50 cal movement. Up until now I have thought that the .50 cal movement would do nothing but harm the industry and the game for milsim players. I won't discuss my rationale for feeling that way, as it has been spouted countless times on various milsim forums. All that being said, yesterday, my opinion changed. And it wasn't because my opinions on the caliber or G.I. Milsim's motivations have been altered, it was because of G.I. Milsim's FM50 marker. What G.I. Milsim has done is create one of the more faithful non-replica AR-15 style markers on the market. I thought that G.I. Milsim was deaf to what the milsim player wants, but now I believe they have been listening. 2. A T-style cocking handle. Tippmann doesn't have one. BT doesn't have one. Milsig doesn't have one. 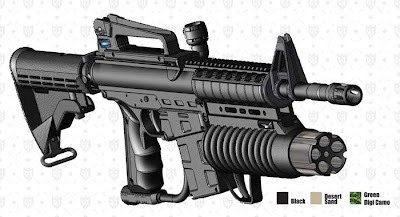 I love those companies, but I don't understand why their AR-15 style markers are still stuck with side cocking handles. 3. 20 round mags. While Milsig has great mags, they are rather bulky. From what I've heard, the FM50 mags will be close enough to real steel to fit comfortably in any actual mag pouch. 4. Check out the space between the trigger guard and the mag. Wait... there isn't one. Those milsim players who have often complained about the gap between these two components will love this. 5. It disassembles like an M4! Sure, a small bonus, but very cool nonetheless. 6. Available in black, sand, and camo? Other than BT, I can't really think of anyone that offers that range of colours. Alright, now let's look at a few concerning aspects of this marker from a milsim perspective. 1. A picatinny underneath the ASA? Really? What would you possibly mount there? 2. 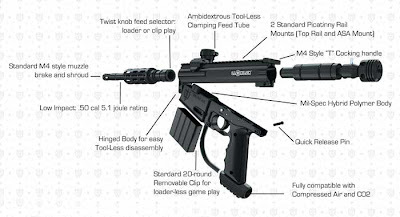 It would be really disappointing if the feed port covers used in mag mode covered the picatinny rail like the ones used for the feed neck do. I think I can speak for mag-fed owners everywhere when I say, "We like our rails undefiled." I like the FM50. I remain skeptical of the .50 caliber movement, as I think everyone should be. This is our game, and we choose how we play it. Great write up. Hope to see more this detailed in the future. Keep up the good work. If it were available in 0.68 caliber, Sandbox, I would be sold on this marker - like, right now. Sure, I might be stuck playing with a hopper, or even a tiny magazine - but it would be worth it to play with a proper AR-15 clone. Thankfully, Eric Engler is capable of adding a T-handle to my receiver, so that's my step in the right direction. Kudos for a decent write, Sandbox!